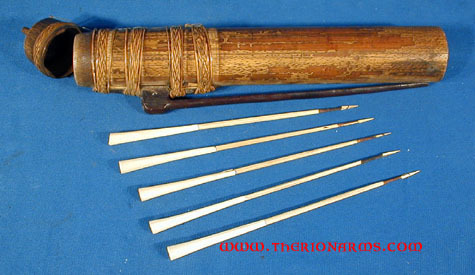 This set of Sumpit & Tabang Anak Sumpit (blowgun and dart quiver) came from the Dayak people of Kalimantan, Indonesia. Used by Dayak hunters for small and big game. 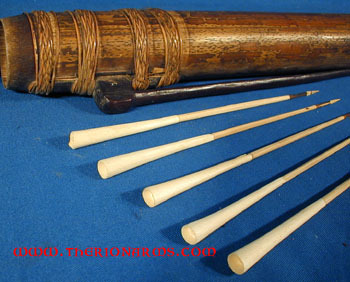 The blowpipe is made from hardwood (likely iron wood), carefully drilled out through the center. Attached is a small damascus/pamour steel spear head, tightly bound onto the tip with woven split rattan covered with a melted-on bee's wax. 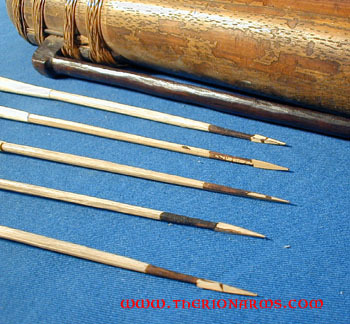 The dart quiver is made from bamboo. Attached is a wooden folder carved from the branch of a hardwood tree nicely bound in place with woven split rattan bands. Base of the quiver is a rubber plug held in with bee's wax. Five newly made poison darts are included. Consult local laws before considering purchase, and for your own sake, don't do anything stupid with this weapon.